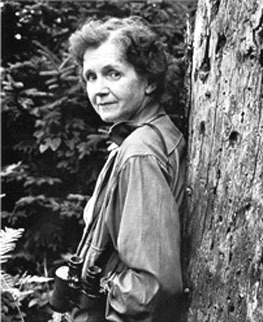 Rachel Carson studied biology and zoology, and worked for the U.S. Fish and Wildlife Service. Beginning in the 1940s she wrote several books about marine biology, and her 1952 book The Sea Around Us was successful enough to allow her to quit her government job. A new pesticide, dichloro diphenyl trichloroethane (DDT), had been introduced in the early 1940s, and for years Carson chronicled the compound's adverse effects on marine life, but her 1962 book Silent Spring was the first work to detail the dangers of pesticides and pollution for a large audience. The book explained in literate but layperson's terms how the chemicals and toxins in DDT and other insecticides such as dieldrin, heptachlor, malathion, and parathion travel through the food chain, contaminate the environment, remain for many years in soils and waters, and accumulate in the human body. Even before it was published the book drew threats of lawsuits and was deemed controversial. In 1963, the anthology series CBS Reports produced an episode about the issues raised in the book, but could find no sponsors to buy commercial time. The pesticide and chemical industries mounted an intense publicity campaign challenging myriad aspects of her book's science, akin to the tobacco industry's claims that smoking is safe, or the coal and oil industries' present-day claims that global climate change is faulty science. She was also smeared as a communist, a lesbian, and an atheist, though the evidence for any of these claims is scant. Contrary to another common misconception, she was not opposed to the use of insecticides and chemicals, only their indiscriminate, widespread use. Neither Carson nor her book called for the complete banning of DDT, and she always maintained that DDT was a vital tool in the fight against malaria. President John F. Kennedy's Science Advisory Committee researched and confirmed the science of Silent Spring, and she testified before Congress in 1963, setting the stage for the first legislation regulating pesticides. Carson was battling breast cancer as she wrote the book, and succumbed to the disease in 1964, two years after it became a best-seller. Her book remains popular and influential, and her name was frequently mentioned in the debate leading to establishment of the US Environmental Protection Agency in 1970. She is the namesake of the Rachel Carson National Wildlife Refuge near Wells, Maine.